Columbia-TriStar, widescreen 1.85:1/16x9, fullscreen, languages: English dubbed DD 5.1 [CC] & Dolby Surround, German DD 5.1 & Dolby Surround, subtitles: English, French, double side-single layer, 28 chapters, rated R, 81 min., $27.98, street date 12/21/99. Directed by Tom Tykwer. Starring Franka Potente, Moritz Bleibtreu, Herbert Knaup, Nina Petri, Armin Rohde, Joachim Król, Ludger Pistor, Suzanne von Borsody. When we meet Manni (Moritz Bleibtreu), a small time courier for big time gangster, he is working a standard pick-up/drop-off, and everything is going just fine. When the job is done, all he has to do is wait for his girlfriend, the orange-haired punk girl Lola (Franka Potente), to pick him up. But today is unlike any other day. Due to an incident while she was buying a pack of cigarettes, Lola is late, and Lola is never late. One stroke of bad luck leads to another, and by the time Manni calls Lola, he is at a pay phone with a big, big, big problem. His unforgiving boss will meet him in twenty minutes to pick up 100,000 marks; money that Manni, suddenly, does not have. Lola rushes out of her apartment and down the street, attempting to get to Manni and, somehow, pick up 100,000 marks on the way. She tears through the city, in a whirl of bums, nuns, babies and guns. Down sidewalks, into offices, through traffic and back again. As her feet slap the pavement and the seconds tick down, the tiniest choices become life altering (or ending) decisions, and the fine line between fate and fortune begins to blur. Once in a while, a movie comes along and by the sheer artistry of its creator has the power to invigorate and dazzle, so that by the end, I am completely absorbed with a big smile on my face and reminded of the reasons why I love movies so much. 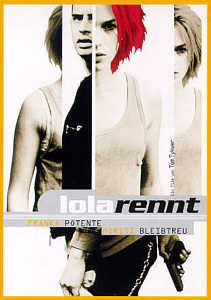 The most recent is Run Lola Run, a thrilling hyperkinetic film by German writer and director Tom Tykwer. A runaway success at both the 1998 Toronto Film Festival and the 1999 Sundance Film Festival, Run Lola Run is one of the most unique films I've experienced this year. Sometimes by describing a film as "unique," I've a certain fear that a reader might interpret it as pretentious or arty, and not unjustly so with the many independent and foreign films. Well rest assure, Run Lola Run's aim is to entertain and does so at an exhilarating pace. At the heart of the film is a conventional love story. Lola's love is put to the test as she has only 20 minutes to come up with $100,000 deustche marks (an equivalence of roughly $60,000 U.S. dollars) to save her boyfriend Manni from certain death at the hand of a mobster boss. While the message of love is universal, director Tykwer chose to deliver that message in anything but a conventional manner. For one thing, our heroine, an orange-haired punk girl, spends a majority of the film running at full strive from one place to another. The film unfolds with three different endings, during the course in which relatively small events and decisions lead to an unexpected consequence. Along the way, there are the principal characters that she will interact that affect not only her actions, but also the lives of these characters. In a very ingenius setup, we get to see a few snapshots of different ways in which their life could turn out. With quick editing and utilizing different shooting techniques and camera angles and combined with an equally electrifying techno soundtrack, Run Lola Run is a breathless experience. The film is presented in the widescreen ratio of 1.85:1 and a fullscreen version on the opposite side of this double sided, single layered DVD. Judging the picture quality is a bit difficult in this film because director Tykwer employs a variety of shooting and editing techniques to create its own aesthetic and stylistic look. The film was shot on 35mm and video, and thus the quality alternates between the two formats. On 35mm, the picture exhibits strong colors, well defined shadow details, natural flesh tones, and sharp images. On occassions, there are a few dirt particles, but this is not to be mistaken with the opening credits, where dirts, lines, spots are intentionally created to give the picture a rough and dirty appearance. On the video segments, where Lola and Manni are not involved, the picture is of poor quality with unflattering colors, under lighting, and graininess. In between the two formats, there are also black and white flashbacks, animation, still frames, split screens, and multiple angles to create one of the most visually stunning film you will see. While I've no reason to believe that the DVD transfer is not faithfully produced, digital artifacts are a problem on some scenes. Once again, moiré effects are the key culprit, with the worst appears on the shot of the deli stand. Music is an important component in any films, but none can be arguably more so than in Run Lola Run, where the soundtrack is nearly non-stop in pulsating franticly to the visual pace. On the production notes included in the DVD, Tykwer points out that "music intensifies everything" and with the help of composers Johnny Klimek and Reinhold Heil, he succeeded brilliantly. The techno music is edited perfectly to match the stimulating pace of the story, and it is nearly impossible not to get an adrenaline rush from the audio and visual barrages. During some crucial moments, the picture is edited in slow-motion and the music switches to a tender cue. This is demonstrated most memorably in a lovely ballad "What a Difference a Day Made" during which Lola and Manni are surrounded by police after a desperate robbery. It's a terrific contrast in illustrating music and images. The soundtrack is encoded on English dubbed DD 5.1 and German DD 5.1. Besides the obvious dubbing on the English track, I did not notice any discernable differences in quality between the two soundtracks. Unlike the video, assigning a grade to the audio portion is a no brainer. The pounding techno soundtrack spreads across a wide soundstage with terrific range in fidelity and clean seperation. The rear surrounds are actively mixed with occassional panning effects to the front. Imaging is nicely projected to put the viewers in a large environment. As for the dubbing, the voice acting is decent, and anyway, there is the alternative subtitle option. The soundtrack is also available in Dolby Surround for both English and German. The main attraction on this special edition DVD is the screen specific commentary by Tykwer and lead actress Franka Potente. Besides the German accents, they speak excellent English and are quite engaging and lively in the commentary. You can sense that they have a good working relationship and this film meant a lot for both. It's interesting to have the director shares his unique vision and the different techniques he uses to manifest the story. Not only that, it's extremely helpful for them to point out the small details that the viewers will inevitably miss during the course of this quick-paced film. Other bonuses include the music video "Believe," which was a #1 hit in the native country; theatrical trailers for Run Lola Run, Orlando, The Dreamlife of Angels ; and the standard talent files and production notes from Columbia-TriStar. A special feature that should have been included is an isolated music-only track, if there is a film that deserve this treatment, Run Lola Run is it! With Run Lola Run, director Tykwer has bursted through the scene and made a indelible impression. I am certainly looking forward to his next project, and in the meantime, the DVD will get plenty of playing time in my household. I am sure that watching Run Lola Run will have a positive effect on you too. Official Site--Find out details about the story, cast, filmmakers, behind-the-scenes, with movie photos, sound clips, soundtracks, and links. James Berardinelli's ReelViews--"Run Lola Run has as much depth as it has energy and action." Roger Ebert--"I would not want to see a sequel to the film, and at 81 minutes it isn't a second too short, but what it does, it does cheerfully, with great energy, and very well." The Unofficial Tom Tykwer Homepage--I am glad that someone already has a web site dedicated to the director with editorial, filmography, biography, images, articles, and more. Franka Potente: The Official Fanpage--Includes news and filmography.